1. BLUSHING BRIDE Metallic crystal beads in silver and blush with an ivory satin ribbon create a delicate waistline on the “Molly” sash. $145 from B Bride in Costa Mesa. 2. GET BLINGY WITH IT For girls who like their glam extra sparkly, this Enzoani beaded crystal and pearl sash will give any gown extra glitz. $450 from La Soie Bridal in Pasadena 3. 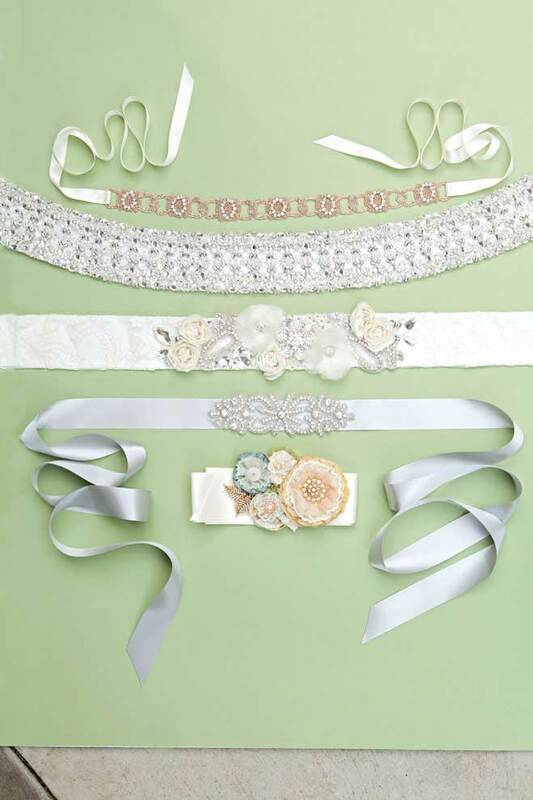 COMING UP ROSES Delicate organza rosettes and shiny rhinestones make the perfect pair in this button-back lace belt handmade by Corona Del Mar’s Camilla Christine. $298 from Camilla Christine. 4. SEW SPECIAL Choose the color of the double-faced satin sash and L.A.-based designer Kathleen Nikolopoulos then adds a hand-sewn beaded and crystal rhinestone appliqué for that essential dose of bling. $47 from BellaCesca Boutique. 5. PIN UP GIRL Four handmade blooms complement two vintage brooches, while antique pearl beads and buttons add a dash of romance. Pin onto a sash or directly onto your gown. $172 from Laguna Beach–based Rosy Posy Designs.